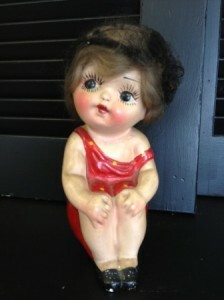 This is a 1930’s chalkware doll. She is labeled “Beach Babe” on the back of her dress. She is 9 inches tall and has a light brown mohair wig. Isn’t she cute! Find other great treasures like this at the Albany Antique Mall in Historic Downtown Albany, Oregon.